A flat rack shipping container is the ideal solution when you have cargo which is large, irregular shaped, oversized or difficult to transport. 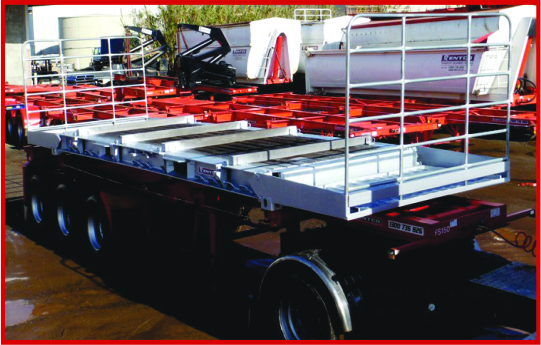 Our 40ft collapsible flat rack Containers consist of a flatbed floor structure with a high loading capacity. Manufactured for strength and durability, they comprise a steel frame and a softwood floor and two end walls, with fixed or collapsible capabilities. The end walls are stable and tough enough to secure cargo safely and several flat racks can be stacked on top of one another. Our Flat Rack Containers, are manufactured to a standard capable of withstanding the harshest conditions at sea, keeping your cargo safe during transportation. If it won’t fit in a regular or open top container. If it’s big, awkward, an odd shape, and seems impossible to transport – a collapsible flat rack container could be the answer you’re looking for. - Need to transport a truck, bulldozer, giant water tank or even a boat? - Perhaps you need to relocate oversized cables, drums, metal sheets, steel coils? - Farm machinery or large industrial parts or equipment? - Bulk construction materials, wood or even a full house? Then one of our 40ft flat rack containers is probably the right container solution for the job. Need more than one flat rack to accommodate your cargo? The good news is that our flat rack containers can be stacked. They may not have fixed side walls or load-carrying structures, but they do have standardised weight bearing corner fittings both at the top and bottom of the container. This means they can still be safely stacked. So, even if the load is wide, rather than high, it can still be easily accommodated. Like the flat rack fixed end containers, flat rack collapsible containers have a floor, no side walls, and two end walls. The difference is that in this configuration, the end walls can be collapsed if necessary. This makes them the perfect solution for shipping over length or over width cargo. Plus, because they can be stacked into a small space with the end walls collapsed they have the added convenience of saving space when they’re being stored or relocated to a different site. We deliver… we’ve built our business reputation on customer service, and pride ourselves on operating a fleet of modern hire vehicles and equipment that is built tough enough to do the job. So, whether you need to hire a flat rack container as a one off, or on a regular basis, we’ve got you covered. Plus, if you also need a truck to move it, Rentco is your one stop shop. We’re committed to offering value for money and very competitive rates for short or longer term hire with the bonus of 24/7 national breakdown support service. With Rentco outlets in Perth, Adelaide, Melbourne, Sydney, Brisbane, Townsville and Darwin, you enjoy good old fashioned local service with the benefit of a national network.